Commercial airports that were originally built as military airfields are often a mixed bag to operate. Costly infrastructure elements such as runways and buildings are already in place, but they weren’t designed to accommodate modern civilian traffic. Casper/Natrona County International Airport (CPR), in central Wyoming, is a prime example. Ever since the U.S. Army turned over its airfield along the North Platte River to Natrona County in 1949, CPR has used several World War II-era buildings to serve an evolving mix of commercial airlines, private aircraft operators and cargo carriers. For decades, the airport housed its snow removal equipment and maintenance department in a military motor pool building; but a new $5.5 million facility, completed in fall 2017, is proving to be considerably more efficient. Because the former maintenance building was not contiguous to the airfield, snowplows and other equipment had to cross public roads to clear the airport’s two runways and associated taxiways—a cumbersome situation that presented undesirable logistic and safety issues, explains Airport Director Glenn Januska. CPR’s new 27,000-square-foot facility is located directly on the airfield, and is much larger than the old military building. It also includes a wash bay for large equipment; 4,000 square feet of mezzanine storage space; a 10-ton overhead crane; a dedicated welding area; a maintenance shop and parts room; separate electrical, plumbing and carpentry shops; a backup power generator; and a security/badged entry system. 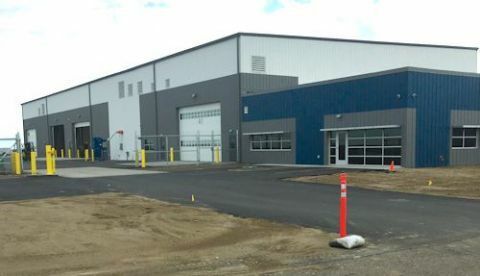 As-is, the new facility cannot accommodate CPR’s entire fleet of maintenance equipment, which includes snow plows, brooms, deicers and tractors. But the building was specifically designed for expansion, and two more 25,000-square-foot phases are already on the drawing board. When complete, the facility will total about 75,000 square feet. Until then, the airport staff compensates by storing off-season equipment in the former maintenance building. The three-phase project began in 2011 with a concept and budget study performed by Mead & Hunt. The outside engineering firm validated what Januska and his maintenance team had known for years: In addition to its remote location and inadequate size, the previous maintenance building was plagued by operational inefficiencies common to old structures, such as inadequate heating/cooling systems and poor insulation. Airport staff members worked closely with Jviation, CPR’s current engineering consultant, to make sure that these and other issues were corrected in the design of the new maintenance building—a strategy that undoubtedly helped make the project successful, says Januska. Andy Remstad, architect/project manager of Jviation, agrees about the importance of employee input. “The institutional knowledge provided by Glenn Januska and his staff, involved from the start, allowed the firm to really dial into the needs and wants of the airport,” he explains. FAA funded about 62% of the project, and the Wyoming Department of Transportation covered approximately 33% of the cost. CPR broke ground on the project in July 2016, with Caspar Building Systems, a local company, serving as the construction contractor. Because most of the construction occurred during winter months, crews largely worked at night, after the winds died down. Despite the cold Wyoming weather and the added challenges of building on a former military airfield, Griffith describes the overall construction process as smooth. Though the new facility is much larger than the previous space, Januska expects to pay less for utilities. “We were willing to spend extra money up front to save in the long term,” he explains. A radiant floor system, for example, circulates hot water under the floor to provide most of the heat in the shop areas. In addition to improved work areas and more equipment storage, the airport’s new building includes welcome upgrades to administrative areas such as staff offices, training areas and break rooms. A full kitchen, showers and sleep rooms facilitate sustained operations during around-the-clock snow events. Radiant floors help maintain a more comfortable work environment in shop areas by offsetting the air movement produced by large overhead doors and specialty exhaust systems for vehicles, welding and carpentry operations. Large overhead fans, isolated heating units and make-up air systems work together to maintain a consistent air temperature by mitigating the effects of massive influxes of cold air when the large garage doors open. Griffith is happy to have played a role in providing CPR’s maintenance personnel with a much-needed upgrade from their previous World War II-era facility. Before working on the project, the Casper resident took for granted the ability to fly out in the midst of snowy winter weather. “You have people working around the clock to make that happen, people doing a tremendous amount of work,” he comments. Thanks to the airport’s recent project, those crews have a more comfortable and efficient base to work from.